Durable, environmentally friendly, and urban focused. Despite minor nitpicks, the Heimplanet Transit Line Travel Pack is quickly becoming one of our favorite backpacks. 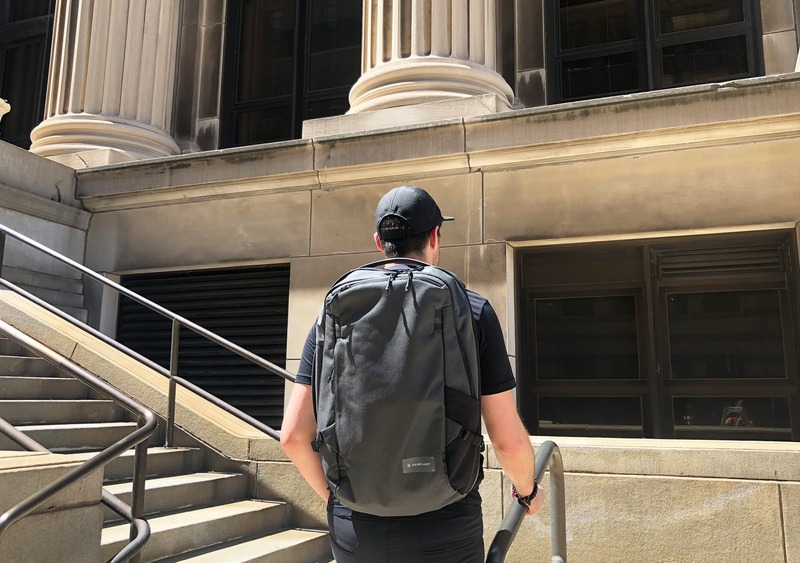 Heimplanet is a tent and backpack company known for their adventure travel and outdoor focus—not exactly a brand you’d expect to find us reviewing… But we’re pleased to announce that they now have a backpack designed with the urban traveler in mind. That’s a lofty goal that we can get behind! But can they pull it off? We put the Travel Pack through two weeks of testing to find out—read on to see how those claims have held up. 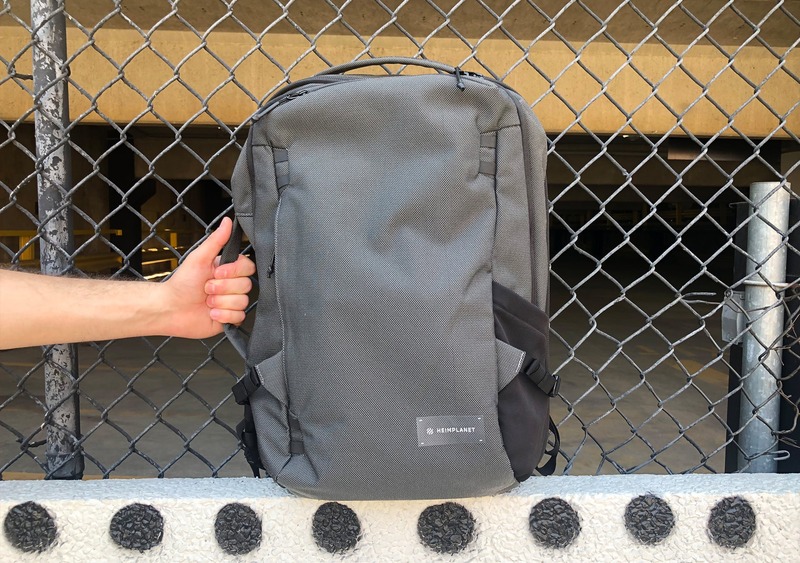 At the time of this review, the Travel Pack is available in just one color: “Castlerock Grey.” We love subtle, minimalist designs so we’ve been digging this muted color. The low-key gray helps this pack blend right in to a modern, urban environment. 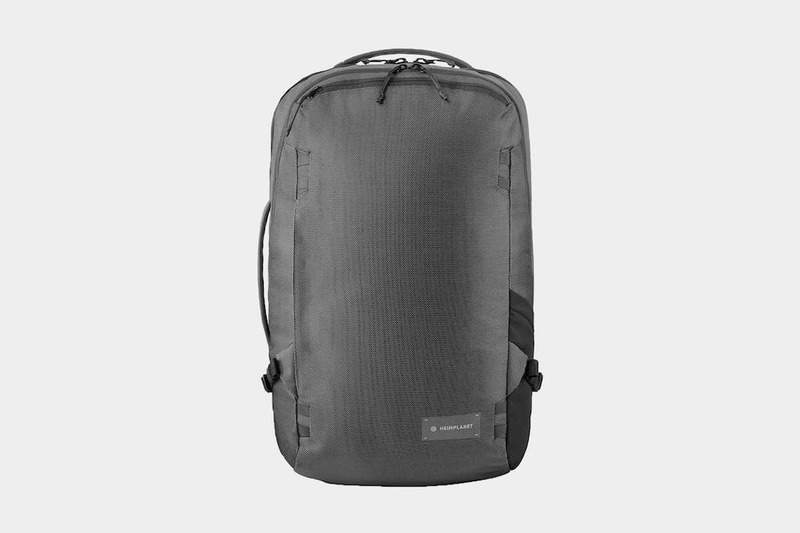 The heathered gray color coordination is created from the two materials that make up the exterior of the pack—specifically, 800D Nylon and 660D Polypropylene. 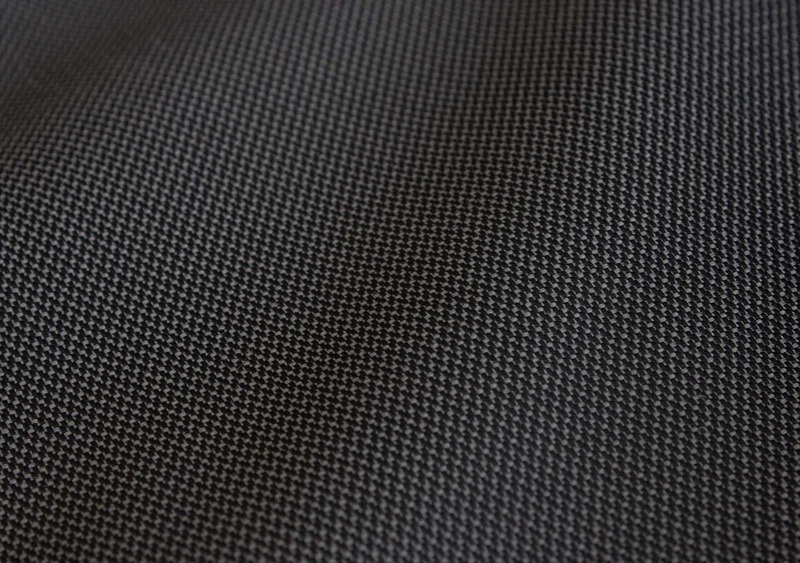 Heimplanet describes this combination of materials as “the heart of the Transit Line,” which was developed for both durability and sustainability. They even go so far as to say the material will outlast the strongest of military-grade fabrics. Will that statement stand the test of time? We’re honestly not sure—after all, we only tested it for two weeks—but we can confirm that this is some seriously durable stuff. But it does beg the question… if it truly outlasts military-grade fabrics, why isn’t the military using it? They call this material “Dyecoshell Fabric,” referring to the fact that they dope dye their fabric—which is a sustainable, more environmentally friendly way to dye fabrics. Building tough backpacks that also protect the environment? That’s something we can definitely get behind, so kudos to Heimplanet for going the extra mile there. One minor downside of this material is that is does pick up some dust, due mainly to the shade. 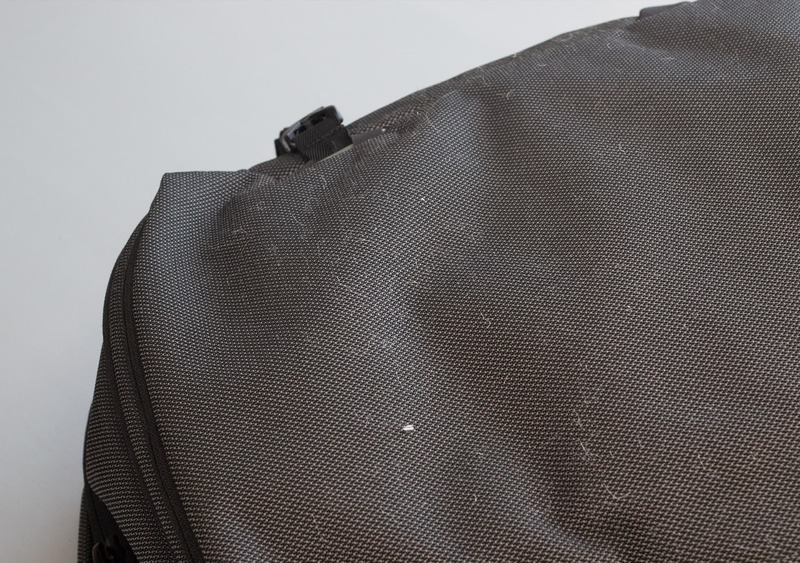 A lot of packs are prone to this, so it’s not a major issue—unless you’re deathly allergic to dust, in which case it could be a very major issue. Side note: At the time of creating this review we had an Instagram poll about whether or not our audience likes the look of this bag. The results? 47% said they liked the look and 53% said they didn’t! Clearly, beauty is in the eye of the beholder—but most of us at Pack Hacker do like the look of this bag. We often run polls like these, so if you’d like to take part in the next one, hop on over to our Instagram account and hit follow. Continuing with the long list of materials featured in this pack, we’ve also got some “rubbery” Hypalon attachment points for the hip belt and sternum strap. They form a kind of “modular” strap system, which we will discuss in more detail later in the review. On to the zippers! If you’ve been following us for any time at all, you probably know what’s about to happen. We’re going to bow down to the YKK gods as we point out that this bag is covered in durable #5, #8 and #10 YKK Zippers. Those #10 YKK zippers are the largest available, by the way—they’re seriously tough and Heimplanet has chosen the water resistant kind. YKK has never done us wrong, and for that, we thank them. Profusely. The pockets and main compartments are lined with some polyester lining. 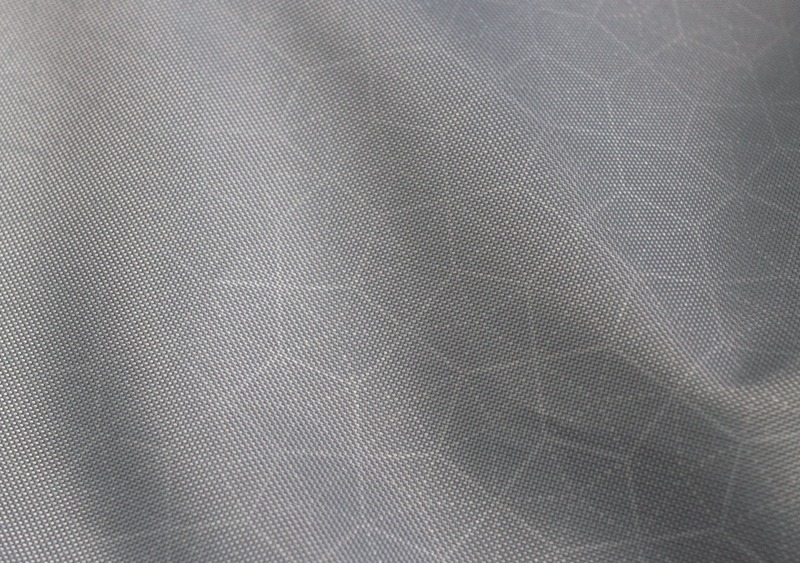 It’s patterned with a very “Heimplanet-esque” design on the interior, which is made up of pentagons and hexagons. It reminds us of their tent designs, which is likely where the pattern comes from. There’s also aluminum hardware in use on the hip belt attachments, which is very durable, and refreshing to see compared to the plastic attachments you see on the majority of packs out there. We’ll always opt for metal over plastic, even if it means a slight increase in weight. And finally, the branding and logo is subtle and tastefully done, which is exactly the way we like it. Overall, these materials come together to create a unique and tight look that we really appreciate. Great looking pack? Check. Now let’s jump into the components and find out how it performs while traveling. 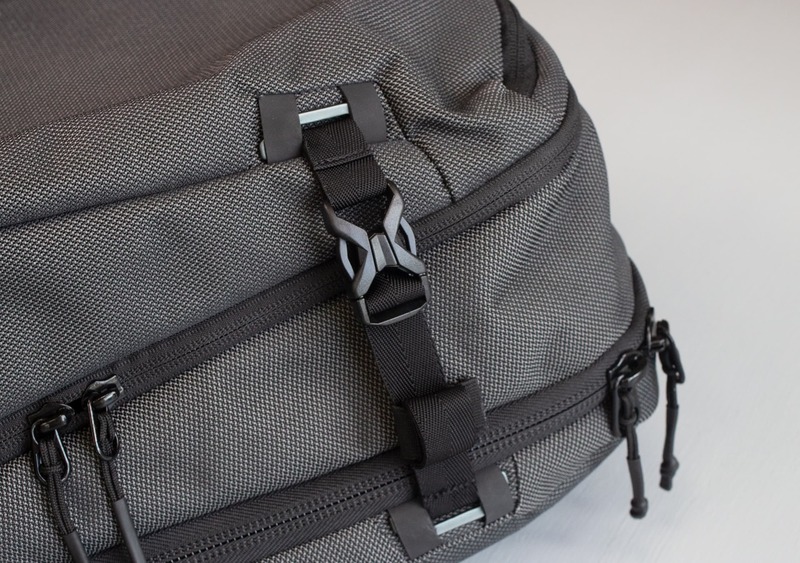 Kicking off the exterior of the pack are two perfectly padded grab handles—one on top and another on the side. The top handle is great for pulling the bag on and off public transport, and getting it out of overhead bins. The side handle we found perfectly placed for hauling your pack short distances, like a quick jaunt to your gate or moving it around through security inspection. We were honestly surprised at how minimalistic and low profile the handles are—they pretty much disappear when not in use, blending right in to the design of the pack. At the same time, they still have enough padding to make them comfortable even when you’ve got a ton of weight in the pack. Really nice execution and material choices on these handles. There’s an ample-sized elastic stretch pocket for a water bottle (we threw the S’well bottle in there comfortably). 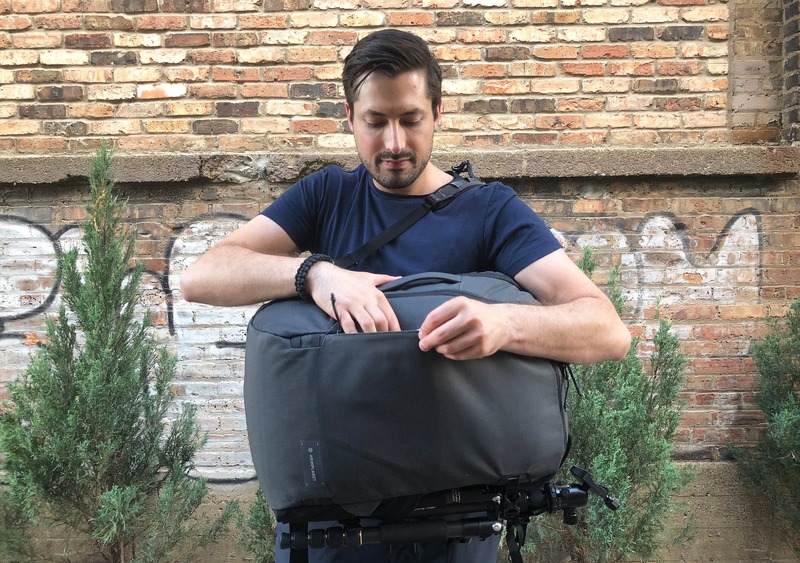 You could also get an umbrella in there or a camera tripod if you utilize the compression straps, which we’re coming to soon. One improvement we’d like to see with the water bottle pocket is a little more stretch variance. The size of items that will be securely “gripped” in here is limited by the lack of flexibility, and it’s possible that smaller bottles might slip right out. 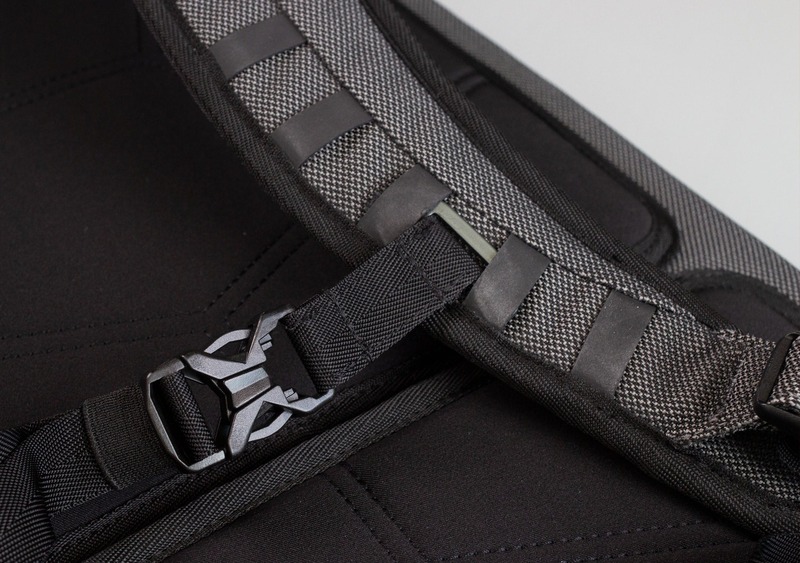 There are two permanent compression straps at the bottom of the pack that are attached right below the zipper to the main clamshell. Excellent placement here—the straps are out of the way of the main compartment, meaning they don’t hinder the use of the main zipper, and the clamshell opens up fully. There’s also an option to attach additional compression straps at the top of the bag using their hypalon attachment system. Aside from the obvious extra compression, choosing to add compression straps here also makes a convenient loop to stuff a jacket into, and you can use it to hold the top of that tripod in place if you’re using the water bottle pocket as a tripod holder—we tried this and can confirm it works pretty well! Now let’s discuss that hypalon attachment system, which is a unique and innovative part of the Travel Pack design. This system allows you to use the straps in whatever way is most convenient or useful to you, rather than being restricted by the choices of the bag manufacturer. What it actually comprises of is a series of rubber loops running up and down the shoulder straps, and a few loops on the front of the pack. To be honest, it’s quite hard to describe in text, so we suggest you take a look at the image above. 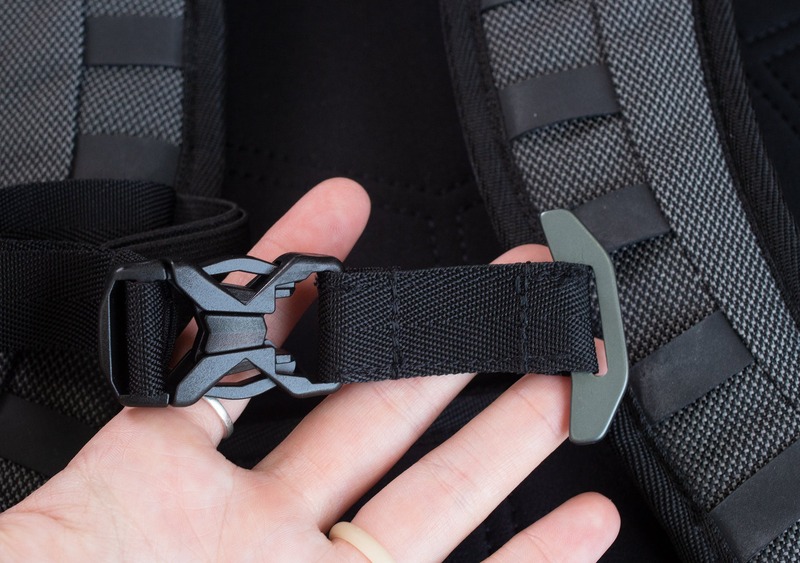 As an example of how to use this system, you can choose to attach the previously mentioned “upper compression straps” in a way that runs across the front of the pack, creating a front carry strap system that you can hang or clip external items to. These front-straps are pretty common on bags, especially for skateboarders (we’re looking at you, Chrome)—but rarely are you able to customize them to your liking. Although innovative, we found the hypalon attachment system to be a tad clunky, and it definitely takes a bit of practice to get the straps on and off. Moving on to the harness system, there are some densely padded shoulder straps that are comfortable even with a lot of weight in the pack. They look pretty thin, but they definitely get the job done. The load lifters—or “Load Shifters” as Heimplanet likes to call them—are great at shifting the weight properly onto your back. Always a welcome addition! There are also strap keepers for each load lifter and some hypalon you can stuff the additional strap into, meaning you don’t have to deal with any excess flapping around your shoulders. The sternum strap attaches with an aluminum bar into those hypalon attachments running down the shoulder straps. As we mentioned with the compression straps, it can be kind of a pain to get these in and out. In addition, we found that at certain angles the sternum strap can pretty easily fall right out! The version of the pack we have is a pre-release model, so we’ve shared this information with Heimplanet, who have taken our fix into consideration for the main production run. Hopefully, this gets fixed up, because an unintentional sternum strap detachment mid-carry is no fun at all. Rounding out the harness system is a plastic strap keeper on the base of the straps. This keeps excess strap tucked away—which is a welcome feature for sure—but we’ve found it often gets twisted up and takes a bit of getting used to when tightening up the straps. We’ve actually noticed a lot of elastic keepers on this pack, keeping all the straps under control and creating a really enjoyable #dangleFreeExperience! We are all for dangle-free travel and wish other packs would go to this length to keep excess straps hidden away. Taking a look at the back panel, it’s well-padded and features a pass through system for your roller luggage handle. This is a nice feature that’s a nod in the direction of the business or casual traveler, from a company that usually focuses on outdoor and adventure travel. 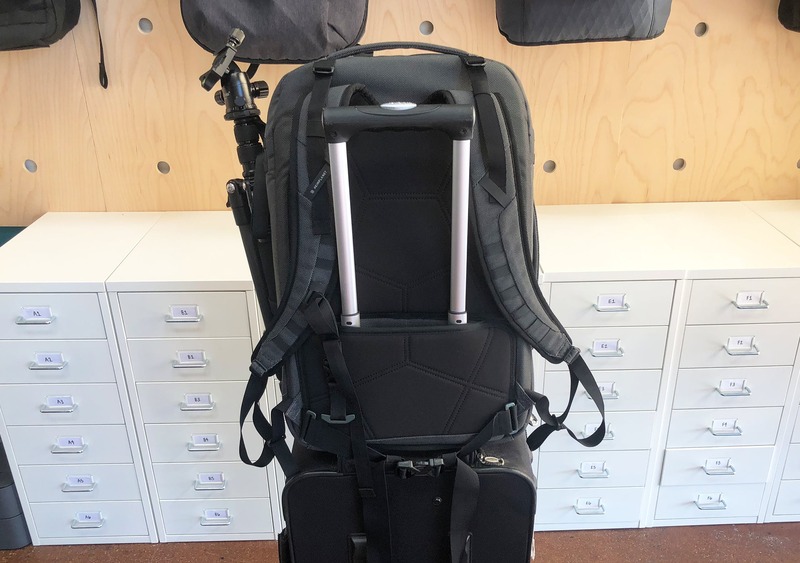 The pass through system is well placed and also doubles as a strap hider, in case you just want to use those grab handles and don’t want shoulder straps hanging around. 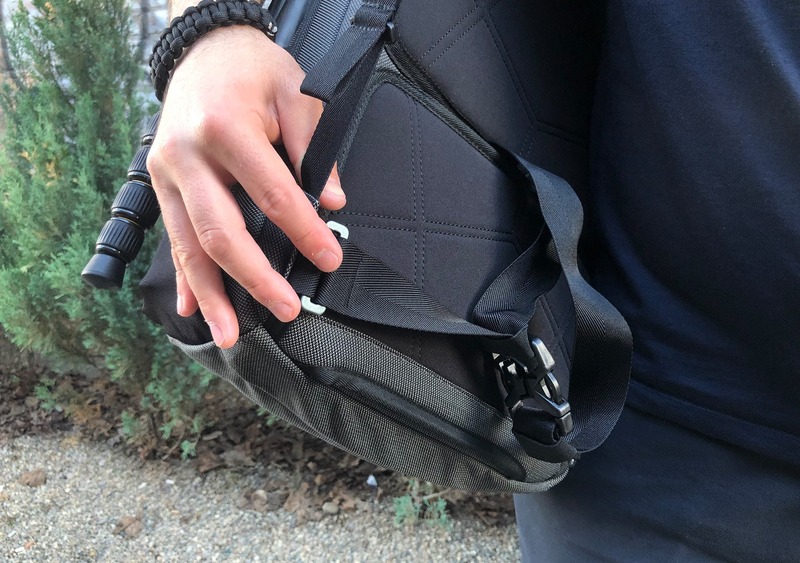 The hip belt—which is really more of a waist strap due to the height of the bag—is removable via those strong aluminum clips we mentioned earlier. 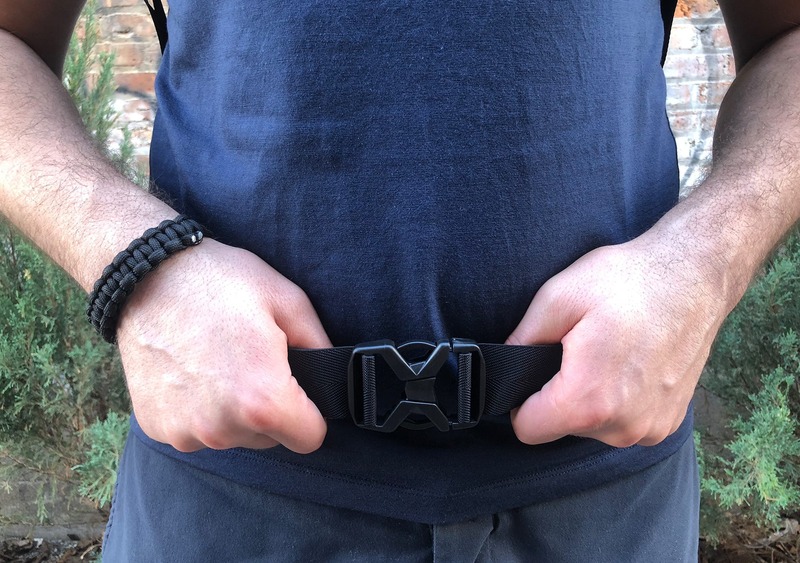 If you’re having trouble detaching the hip belt—or like us, you’re just too lazy to do it because you know how fiddly it is—you can tighten the strap down and sort of hide it away until you want to use it. One thing with this hip belt is there isn’t a ton of padding to it. So even if you did have a lot of weight in the pack, it’s not going to be all that comfortable. And to be honest, the positioning of this hip belt doesn’t feel like it distributes a ton of weight off of your shoulders anyway. So rather than taking a huge load off, we found the hip belt is better suited to just keeping the pack anchored on your back. At the end of the day, at 34L this pack isn’t that big—so whether you need a hip belt or not will be up to you and the gear you’re carrying. If it’s not needed, it can be removed and left at home. 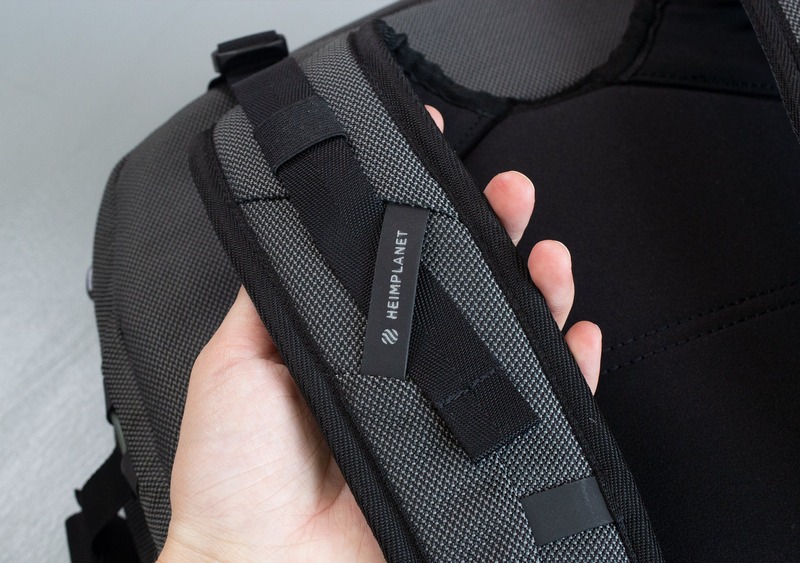 Although we have a couple gripes with the harness system, overall it’s a really solid, comfortable carry. 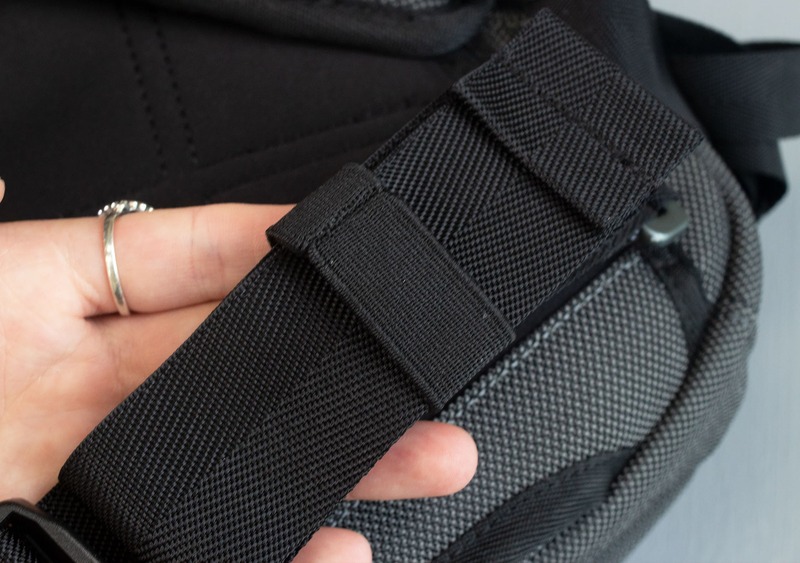 If they update the hypalon loop system so the sternum strap is more secure and add a little padding to the hip belt, it would be pretty close to a home run in our book. Starting at the top of the pack, there is a quick access pocket that has ample space for quick grabs—perfect for your passport, phone, and other items you’ll want to reach for as you’re dashing through airport security. This pocket is closed with a YKK Racquet Coil #5 zipper. Racquet Coil zippers are used on a lot of luggage due to their strong attachment points, so it’s good to know that your essential items will be securely stowed away in there. There’s another pocket on the side of the pack, which we think is quite cleverly positioned. 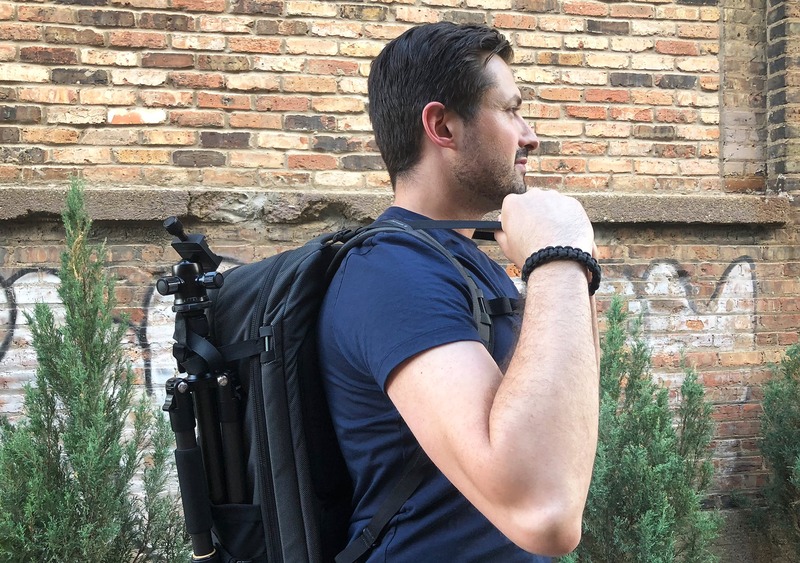 If you’re wearing the pack on your left shoulder, you can slide it around to the front of your body on that shoulder strap, and the pocket is right there, facing upwards. We like to think we looked super slick and cool every time we did this—but that might just be our imagination. Either way, a nice feature. 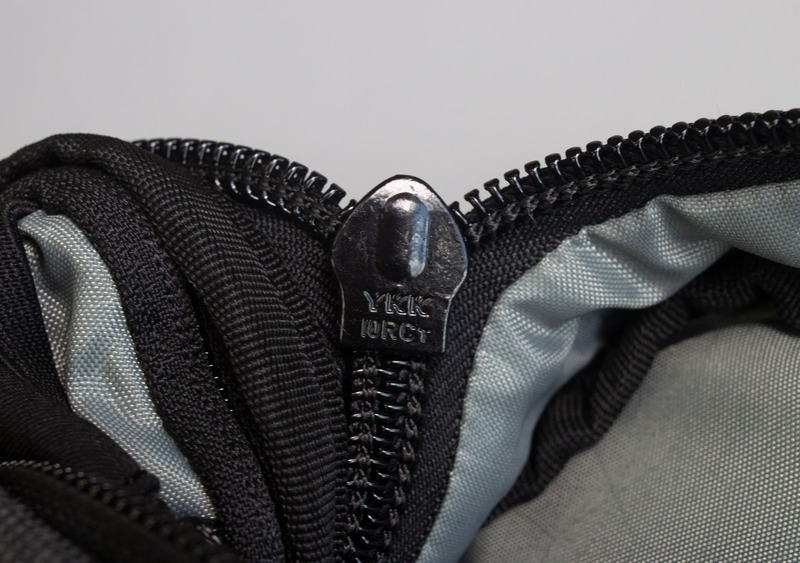 Moving on to the main clamshell compartment, we’ve got a #10 water resistant YKK zipper closing it up. That’s pretty much the strongest zipper they make, so your gear will most definitely be safe inside and you shouldn’t have any durability issues. Unfortunately, these zippers aren’t lockable. This is kind of a shame, particularly for one bag travelers who want to ensure their gear is safe in the hostel or on public transport. Making the zippers lockable would have been a simple addition with a big impact. The zippers are also water resistant, which is a great choice. That doesn’t mean the bag is waterproof (it’s not) but the extra water resistance is a good addition as it prevents water seeping through the gaps in the zipper, which can be an issue with larger zipper sizes. Moving on to that main clamshell compartment—this thing opens WAY up, allowing you to organize and access everything inside. 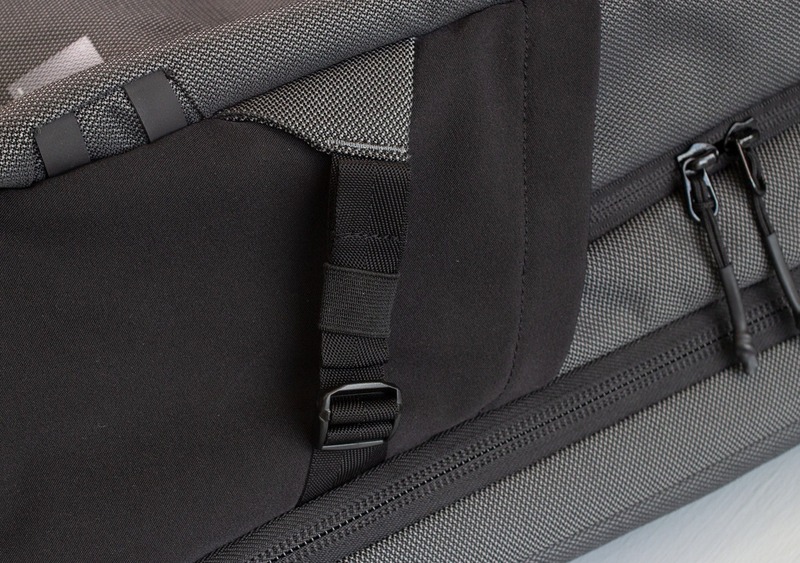 Looking at the back panel first, it features a large, padded, felt-lined laptop pocket with a velcro latch to keep the laptop in place. It’s big enough for even the largest laptops—we fit a 15 inch MacBook Pro in there without a problem. Below that there’s a smaller pocket for a tablet, which is the same in all other aspects except that it doesn’t velcro shut. There are two elasticated mesh pockets just below that, which are very flat and ideal for storing papers or flat documents, and are tight enough to clip pens on to. It’s interesting to see organizational features near the laptop section—a rare addition in our experience—and we found them useful for anything work-related. However, they aren’t 3D, so don’t expect too much capacity. Moving on to the other side of the clamshell, we have some lay-flat 3D pockets made from the same mesh material. The good thing about these pockets is that their capacity can still be useful when the main compartment of the pack is fully loaded. The flexibility of the mesh and the 3D design means they’re somewhat independent from the liter size of the main compartment. This a well thought out system that has been executed really well. 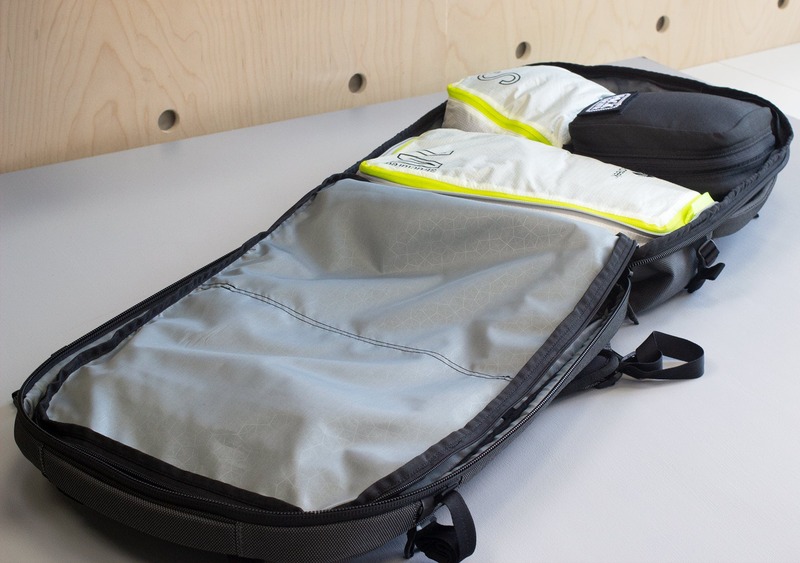 The packing of the main compartment is similar to the Minaal Carry-On 2.0, which they refer to as “scoop side packing.” You simply open the main zipper for full, unobstructed access to the roomy main compartment. We like to use packing cubes—such as eBags Ultralite Packing Cubes or one of the Eagle Creek Pack-It Spectre Cubes range—to maintain organized packing. 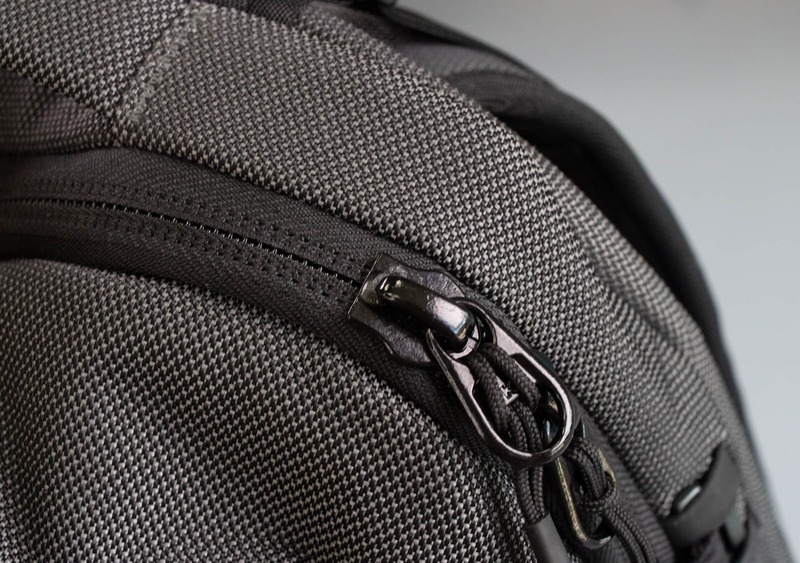 Here’s a unique feature you may not have seen before: there’s a horseshoe zipper at the top, on the front of the pack, which opens up to allow you to reach into the main compartment and grab essential items rather than opening up the full clamshell. This is great for when you’re outside and it’s either unsafe or unwise to be opening your pack up fully. We found this allowed us to be strategic when packing the bag, placing essential or potential quick-grab items near that zipper opening, making them easily accessible while out and about. At first, it did seem a little clunky—it looks weird when the pack is empty, and also necessitates the weight of an extra zipper. However, in practice we’ve found it to be really great for compartmentalizing all your gear and providing access from both ends. Very smart thinking here that benefits the packer, and a really nice feature that solves a genuine problem. Overall, we love the internal features of this pack. The capacity of the main compartment isn’t affected by the pockets, and the organizational features are all functional and practical. At the time of this review, we’ve been using this pack daily for about two weeks. We can report that it’s been “so far so good,” and we haven’t experienced any major issues. Although we’ve noticed a couple gripes with the harness system, there weren’t any durability issues that affected the performance of the pack—just minor nitpicks that affected experience. Heimplanet uses a bunch of high quality materials when putting this pack together, and they even go as far as to challenge military grade materials to an endurance competition in their Kickstarter video! 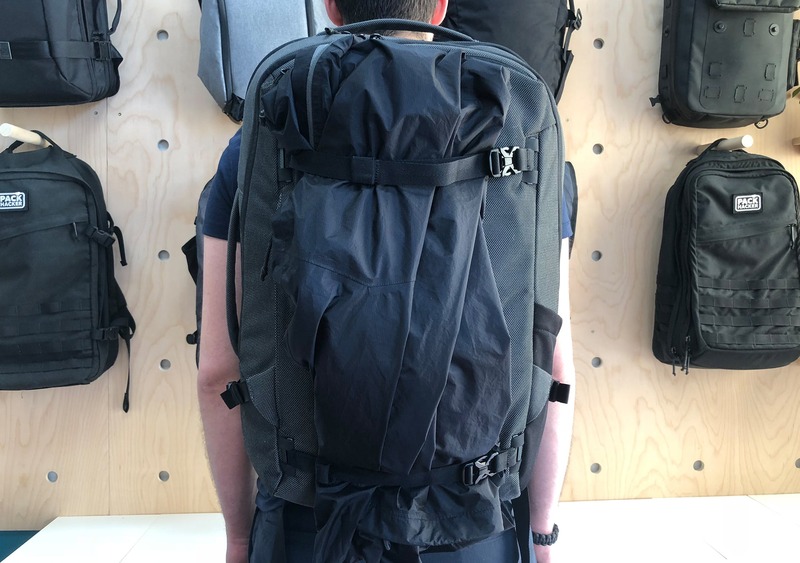 We certainly don’t anticipate any major durability issues with this pack and we’re excited to see how it holds up with continued and extensive use. Great aesthetic and durable materials. No external blemishes or damage. Expect it to keep performing without problem. Great design in terms of both aesthetic and function. Everything comes together really well. Well thought out components and functionality that work well in practice. Liter independent compartments make for easy packing. Although innovative, the Hypalon attachment system is a tad clunky. Shoulder strap tightening mechanism takes a while to get used to. Hip belt not padded and doesn’t distribute much weight. We’re really excited about this urban-focused release from Heimplanet and the smart thinking that went into its design. 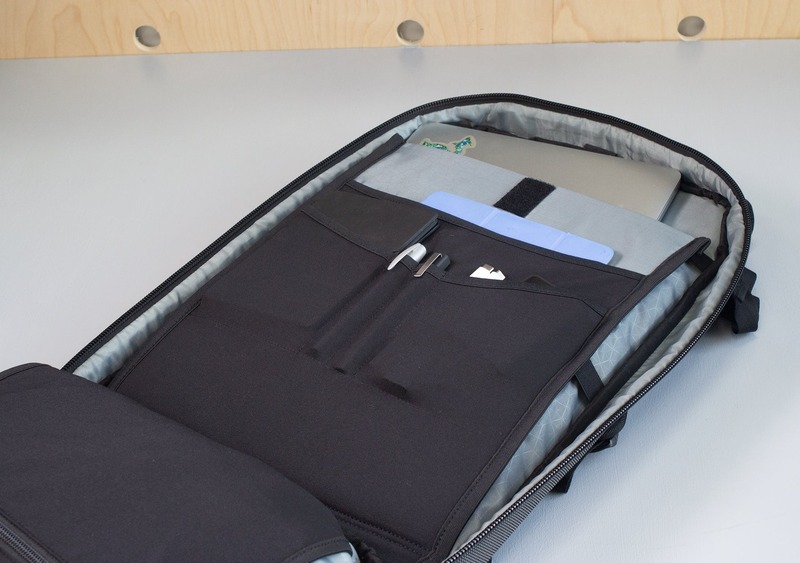 The 34L size and dimensions are great for carry-on travel across the globe. This pack is climbing up the ranks to become one of our favorite packs, despite the couple of nitpicks we’ve found. 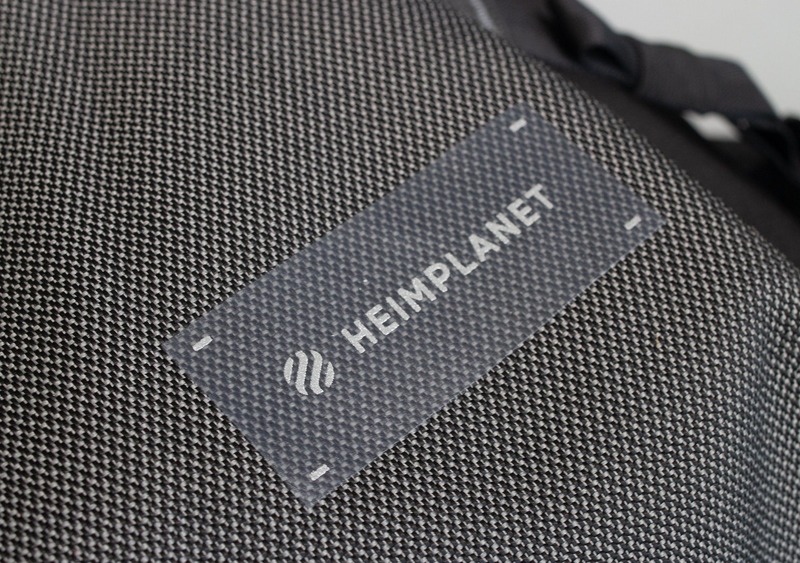 If Heimplanet fulfills their promise of updating the spacing on the hypalon system that holds the sternum strap, it will be even better when the pack goes to production.